This book treats worldbuilding as a process for conflict and exerting pressures on your characters. Unforgettable characters live unforgettable stories that are made necessary and possible by unforgettable worlds they are trying to survive and thrive in. So though this is a book for writers and not for interactivity, it’s bringing in some of the same worldbuilding motives as a tabletop game like Downfall. It is theoretically possible for you to create an unforgettable imaginary world in the same way that JRR Tolkien did if you have an advanced education or deep training in one particular field relevant to worldbuilding, plus an inquisitive mind that is always asking questions about how your area of expertise informs and is informed by others. For example, if you are a gifted economist, you might begin building a world from the ground up if you start by designing a unique and detailed, though fictional economy… This kind of deep dive is rare because it requires more than just a “research phase” to inform a novel or screenplay. It relies on committed, dedicated expertise and conversation with other experts in that area of knowledge. I found that pretty interesting because of my own interest in the idea of research art — but also a strong argument for why not all worldbuilding on all projects needs to go the Tolkien route. And certainly most of mine doesn’t. Instead, Litore recommends the approach of inserting an importantly different detail in each of three areas: the physical conditions of a world and the requirements of surviving there; the biology and the creatures who live there; and the culture that persists there. He then devotes several chapters to unpacking each of these techniques. Earlier this month I took a one-day design masterclass with Punchdrunk, the immersive theatre company. I’ve previously written about seeing their work Sleep No More and Against Captain’s Orders. Their work has been a design inspiration especially for thinking about narratives where the characters are all in motion and the player is choosing which to track. Going into this session, I was curious whether I’d learn methods of environmental storytelling that would cross over into game applications. I was also curious how they approach developing a physical space around a story concept, and what questions they ask in order to develop the character. If you’re considering signing up for a class — I think they’re on hiatus now, but the opportunity might reopen in the future — I’ll cut to the chase and say that it was a fascinating, fun day and totally worth doing; that I enjoyed the activities and instruction and had a great time meeting the mix of other practitioners in the same space, who included museum curators, drama instructors and students, other game designers, and a few “I just love Punchdrunk and was curious” types. At the same time, I should acknowledge the news about the harassment of actors at Sleep No More productions. This didn’t come up in the course of the workshop, and I had scheduled mine before that news item broke, but I mention it in case that information affects your desire to engage with the company’s work. The rest of this article will be talking specifically about what we learned in the context of video game design and story-telling — some items that I found expectedly or unexpectedly useful, and also some places where I’m not sure the inspiration would successfully cross over. So this year I’ve been trying (with only partial success) to publish a review of a CYOA book on the 5th of each month. “CYOA book” here may be a paper book or a Kindle ebook with links. This month, though, the CYOA book I originally planned to cover turned out to be enough of a non-starter that I didn’t want to post a whole review just griping about it. So instead we have a non-mapped, non-CYOA print book, but one I think might be of some interest to the kinds of people who like IF. 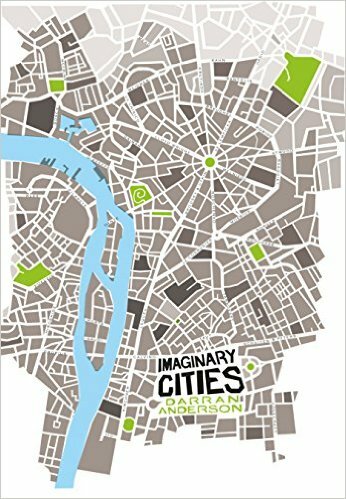 I enjoyed reading Imaginary Cities. And yet — maybe because so much of the content is about formal experimentation? because my memory for isolated detail is not as good as I’d like and I want to retain more from each page than I do? — I kept wondering if it might have been better in some form other than a book. 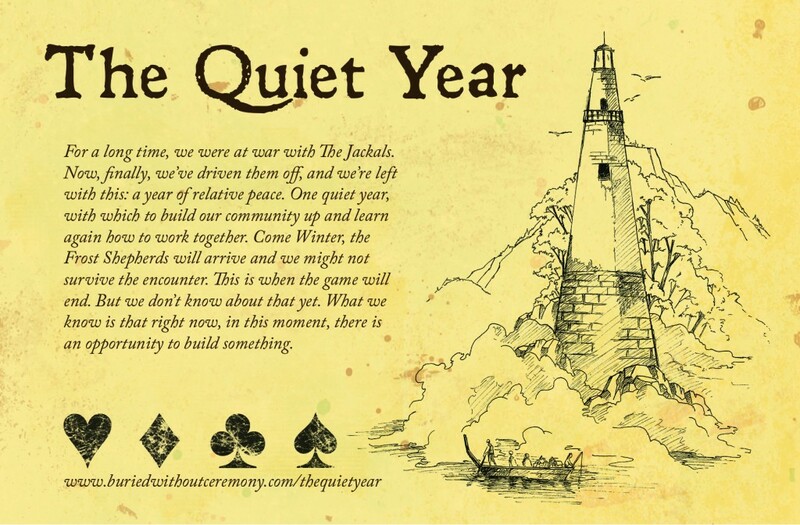 The Quiet Year is a story game about one year in the life of a threatened community. The War with the Jackals (not explained) is just over. The Frost Shepherds (also not explained) will turn up in a year, though the inhabitants of the town don’t know that. In the meantime, there are up to 52 turns (one for each week of the year), and a deck of cards is used as a randomizer to determine what sorts of things might happen during those weeks. Each turn, a player draws the next card, follows instructions from a chart about what that card means for the community, and then takes one of three actions: proposing a communal discussion about a particular issue; discovering something new in or around the community (which means drawing it on the map); or starting a project (also drawn on the map, but set to conclude several turns later). By the time play is over and the last card is drawn, the map is large and complex and bears signs of many events that have happened to the community. Our story told of a group divided by religious disagreements, threats from outsiders, limited resources (especially iron, which we didn’t have much of until late in the story), and a certain amount of archaeological curiosity. Play begins with the participants agreeing on some very broadly-described beginning and endpoint to a history — the rise and fall of an empire, the glory and decline of a dynasty. Our group chose the history of a multi-deity religion from its inception (a sort of contract between gods and men) to its downfall (the point where the gods refused to interact that way any further). The selected beginning and end are written on blank cards and set on the table. 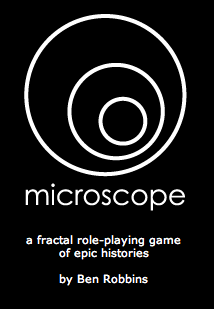 Players then proceed to add more cards to the timeline: named periods (which can be inserted anywhere between the beginning and the end), events (attached to a particular period), and scenes (involving a particular event, and intended to answer some narrative question about that event). The scenes are where the roleplaying actually occurs, starting from some premise and continuing until the narrative question is answered. There are a few additional mechanics to provide some focus, and it’s possible to challenge a story choice that another player has made, though in practice we never did this. In general, the mechanics were less concerned about creating and resolving conflicts (a theme found in both the story games I played at a previous meeting) and more about discovering and developing interesting concept threads in the world-building. Players are encouraged to move back and forth through the timeline, creating longterm repercussions for one another’s choices, or conversely setting up other parts of the story by designing prequels for them. In practice, I felt like this design made for some very loose, uncertain play at the beginning. When the game is just starting out and the players are throwing in almost random events, there’s a sense that continuity is never going to be established. How are we ever going to link up The Great Pilgrimage with The Revision of the Dietary Laws? What matters and why? Do we all just have completely different ideas about who these characters are, or what? And because collaboration is restricted only to the contribution of periods/events/etc., you’re not allowed to propose an idea in full, by, say, laying out a whole imagined sect you have in mind. As in improv, you can only make offers and then let your collaborators pick up on them. Even so — and I don’t say this as a complaint, exactly — it felt to me in a lot of ways more like a collaborative world-building game than an interactive story-telling game. What we ended up with was a semi-coherent history with several major recurring themes or issues and some brightly-colored incidents. People had partitioned souls, and could use specific soul-aspects to do things. It was possible to bottle up some aspect of your soul in order to keep it under control. The Coracle Philosophers discovered the way to elevate the God of Swamps to Living status by accident during a council session, though fortunately their ritual coracle-skirts allowed them individually to paddle away and survive the deluge. The moosetaur guardians — but no, I’m verging on sacred secrets here. In any case, it all makes a kind of performance art out of the act of invention itself. Which is cool. I think I need a few more playthroughs to really be at ease with this one, but the concept is definitely neat. Balance of Powers is a dark new alternate-history world from the team that wrote Perplex City. Follow the free-to-read story online, with eight chapters unfolding over eight weeks. …Or better, sign up and receive bonus content in email, artifacts in your mailbox, or be invited to take part in live online events. Balance of Powers is being launched on Kickstarter by Adrian Hon, Naomi Alderman, Andrea Phillips, and David Varela, a group that includes veterans of game and ARG design, live interactive events, and conventional fiction writing. The four of them were kind enough to answer a few of my questions about their new project — talking about pacing, storytelling as performance, and the narrative value of feelies. Balance of Powers is set to unfold over eight weeks, one chapter a week. Can you talk a little about the function of time in your storytelling? How do you want the experience to differ from just sitting down and reading the story in one compressed session? The time between installments doesn’t just allow for reader speculation, either – it lets us peek at, and perhaps be influenced by, that speculation. The great thing about writing something online is that, unlike print materials, you can tweak at the last moment if you have a really fantastic idea. And it’ll allow us to drop in the other cool items – like our newspaper – between episodes, at a point in the story where they’ll have most impact. The long timeline also gives people a chance to read at their own leisure without feeling that they’re being left behind. Having said that, we hope that the readers will be really looking forward to each week’s installment. TV execs talk about ‘appointment television.’ We want this to be ‘appointment reading’ because they’ll want to discuss and speculate about the story with their friends as soon as they’ve finished.